French painter active in Prussia. He studied with his father, the portrait painter Thomas Pesne (1653-1727), and with his maternal great-uncle, Charles de La Fosse. In 1703, as a pupil at the Acadmie Royale, he would have won the Prix de Rome with his Moses and the Daughters of Jethro (untraced), had not Jules Hardouin Mansart, adviser to the Acadmie, deemed all entries that year unworthy. Nevertheless Pesne left for Italy, making the acquaintance of Jean Raoux in Venice and being allowed the use of a studio in Rome by Charles Poërson, Director of the Acadmie de France. While in Venice, Pesne painted the portrait of Friedrich Ernst von Knyphausen (Berlin, Schloss Charlottenburg, destr. 1893), a lively work indebted to Veronese that is said to have decided King Frederick I of Prussia to invite Pesne to Berlin. In 1707 he was appointed court portraitist to Frederick I of Prussia. Under Frederick II he decorated the interiors of various royal palaces and continued to paint portraits, remarkable for their brilliant colouring and perception. 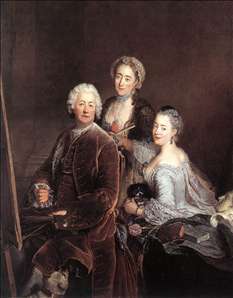 As the director of the Berlin Academy of the Arts from 1722, Pesne became famous through his portraits of the Prussian royal family and their household. Many of his portraits hang in Berlin Museums and in Charlottenburg Palace. These include (among others) his portraits of Frederick II and his brother Heinrich. The ceiling paintings in Charlottenburg, Rheinsberg, and Sanssouci Palaces are at least partially his work. 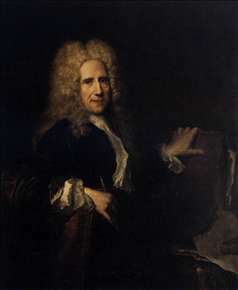 In 1722-24, Pesne traveled to England. He died in Berlin. 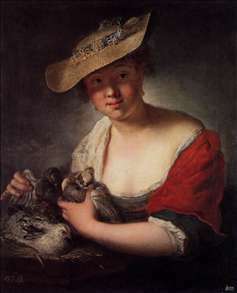 See more details about "Girl with Pigeons"
See more details about "Jean Mariette, Engraver"
See more details about "Self-portrait with Daughters"